The first entry is from June 1/05. 2015 has been a very busy internal arts year. Great seminars and lessons all round. I really feel many students have made progress this year and am forward to what 2016 holds. Congratulations to the graduating participants of the 2015 5 Section Taijiquan Full Curriculum Intensive in Canada! We worked very hard, covered a lot and had a great time! I'm very excited about the level II Yang-style Taijiquan Intensive at Daqingshan Mountain in China. This will be the most advanced training I have given so far. Please note: the course has been shortened in length from six weeks to three weeks. 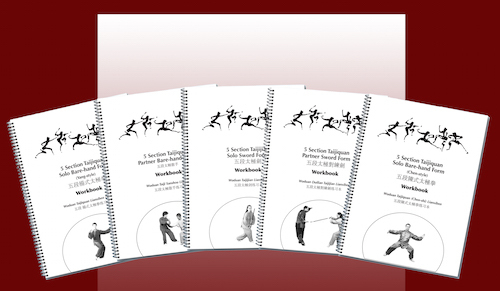 The five 5 Section Taijiquan workbooks have been very well received. Being able to make notes in a systematic way with these excellent learning aids is making the process of learning the 5 Section Taijiquan Program simpler and clearer. (Spanish and German are scheduled for the winter). 'Old Thoughts on Taijiquan' a collection of eight of my essays rewritten and reedited is nearing last draft stages. With introductions from Grandmaster Shouyu Liang and Master Nick Gracenin, 'Old Thoughts' will be available early in 2016. This has been quite a year so far. 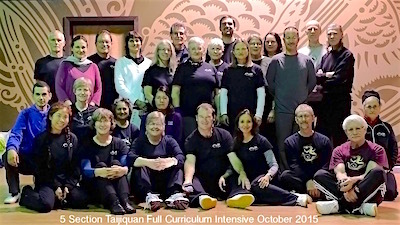 Part 1 of the 2015 5 Section Taijiquan Full Curriculum Intensive in Canada was excellent. We're looking forward to Part 2 in October with a special focus on the 5 Section Partner Sword. 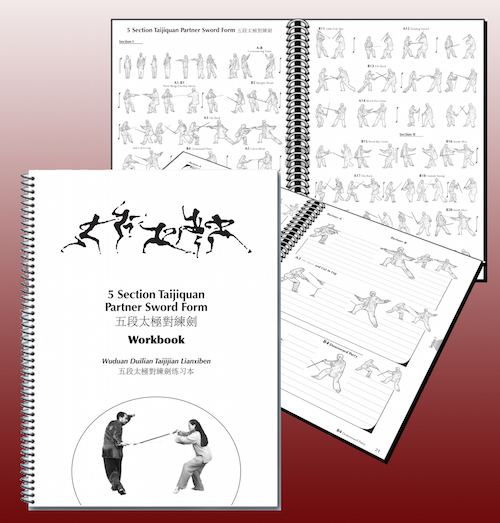 Speaking of which�Yanira has finished the 5 Section Taijiquan Partner Sword and Chen workbooks! 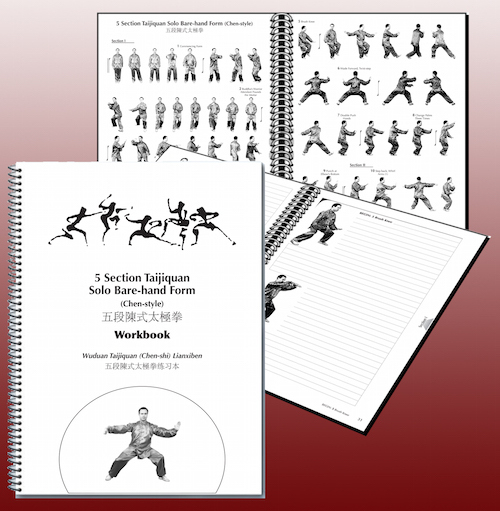 They look great and are now available along with a special offer for all five 5 Section Taijiquan workbooks in English (Spanish and German are scheduled for the winter). We're nearing the final stages for the essays book, tentatively tiled 'Old Thoughts on Taijiquan.' Hoping it will make some nice winter reading for you! Very excited about next year's 2016 Yang-style Taijiquan Full Curriculum Intensive (II) at Daqingshan Mountain. During winter I usually plunge headlong into a variety of 'some day to be released' writing projects. Here are a couple showing real promise for completion in 2014. We're nearing the final stages for the essays book, tentatively titled 'Old Thoughts on Taijiquan.' Hoping it will make some nice winter reading for you! The two volume '5 Section Taijiquan' has been on slow-burn for several years now. It's coming along in stages. In the meantime, Yanira and I have been dipping our twenty toes into publishing with a workbook series on the 5 Section curriculum. Here's what we now have available! They are all available in English and Spanish with German editions on the near horizon. We expect to see the 5 Section Chen and Partner Sword Forms out by October. Order here. We also intend to have a first volume of essays, articles, hand-outs etc. available by late fall or early winter. These are mostly pieces that have been published in some venue or another but are being reworked and reedited. The three passages that follow, appear in various forms throughout classical taijiquan literature. From a technical standpoint, they address the all-important issues of �deep-sticking� and �perceptual-movement� (zhīju� y�nd�ng 知覺運動)�ideas at the very heart of the art in terms of both martial art and self-cultivation. While the message contained within is simple and clear, undertaking the advice is difficult. The first passage describes four Chinese characters: �sticking�, �adhering�, �connecting�, �following� (zhān ni�n li�n su� 粘 黏連隨). There are sometimes known as the �four do�s��and have to do with establishing and maintaining connection with a practice partner (or opponent/enemy) so as to cultivate and employ �perceptual-movement�, an ability which leads to martial advantage and furthers the self-cultivation endeavour. The second passage describes the �four don�ts�: �reaching�, �skewing�, �losing�, �resisting� (dǐng piān diū k�ng 頂偏丟抗). These behaviours spoil any chances for development that might arise from good sticking practices. The passage makes clear that these errors are related, not only to an inability to stick well but also to basic confusion about the concept of perceptual-movement. It highlights the fact that dependence on flawed tactics will guarantee substandard results and deny practitioners their full potential in the art. The third passage drives the point home, leaving no question as to the importance of the admonishments given before. It goes a step further in reminding the reader that how players behave toward each other is important. The piece ends on a promising note, suggesting that if one practices according to the advice given, he or she will naturally acquire 'comprehending energy' (dong jin 懂勁) which in turns opens the door to 'spiritual illumination' (shen ming 神明). �Sticking� is raising-upward to �uproot�. �Adhering� is unshakable clinging. �Connecting� means abandoning ego so as to not separate. �Following� means, if 'there' moves 'here' responds. Simply put, it is impossible for a person to perceive through movement without being clear about �sticking, adhering, connecting and following�. 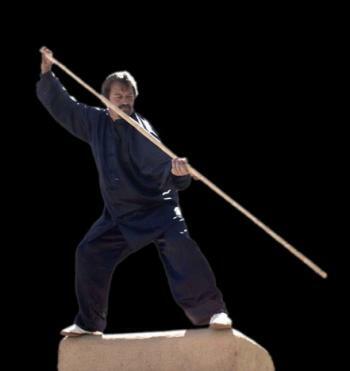 This is therefore, the kungfu of zhan, nian, lian, sui�'sticking, adhering, connecting and following'�and extremely refined. �Reaching� means, so to speak, �poking-head-out�. �Skewing� is the so-called �missing-the-mark�. �Losing� is called �separating-from�. 'Resisting� refers to what is commonly called �the excessive�. Wishing to understand the defects described by these four words; it is not only a failure to understand 'sticking, adhering, connecting and following' but also ignorance regarding �perceptual-movement�. When beginning to study partner work, one must know about this, and, moreover, be aware of these defective practices. Thus, the great challenge in mastering 'sticking, adhering, connecting and following' is not giving into 'reaching, skewing, separating or resisting'�and this is truly not easy. 'Reaching, skewing, separating or resisting' are errors in partner work. They are called errors because, having failed at 'sticking, adhering, connecting and following' how could one consciously perceive through movement? If one does not know oneself, how can he or she understand others? What is known as 'partner interaction' does not rely on 'reaching, skewing, separating and resisting' in exchanges; rather, one employs 'sticking, adhering, connecting and following' when engaging with other people. If you can accomplish this, not only will your partner interaction be without defect, but conscious movement will arrive naturally and you will come closer to success in 'comprehending energy'. I'm in a grateful mood�toward my teachers, my students and the art of taijiquan. At the request of my sifu Master Liang Shouyu, I went to Vancouver to help out as an MC at The Extraordinary Martial Artists of the World Lunar New Year Gala. The quick weekend journey to my former home city was to provide me with many honors. 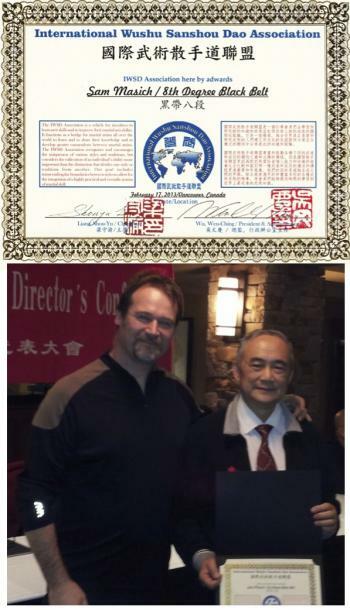 The International Wushu Sanshoudao Association awarded me an 8th degree black belt which was presented by Master Liang himself. the 2nd highest level given by the IWSD. 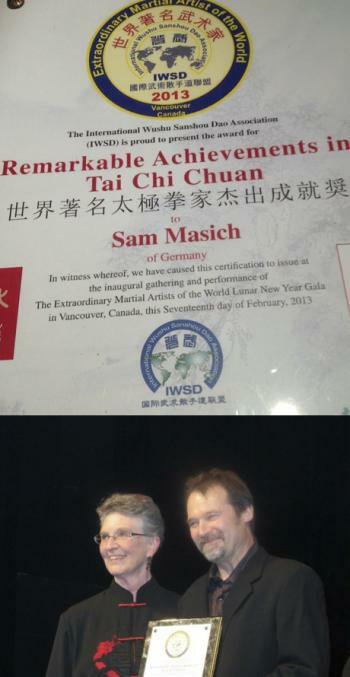 It was wonderful to have my dear friend Pat Rice present me a 'Remarkable Achievements in 'Tai Chi Chuan' award as one of the 100 Extraordinary Chinese Martial Artists in the world today. Pat has been one of my greatest supporters over the last 25 years. 'Remarkable Achievements in Tai Chi Chuan' award. I'm so very grateful for the support of my many wonderful students, as exemplified by Matthew Case, who helped me demonstrate '13 Power Taiji Sabre' on a stage shared with some of the great martial arts luminaries of this era. It is a privilege to work with so many fine people from so many parts of the world. Matt and Sam in some rock'em�sock'em sabre! You'd think that would be enough... On the same weekend I'd gone to visit my grandmaster, Raymond Y. M. Chung, with my first teacher Brien Gallagher. Master Chung was born in 1913 and comports himself with great presence and clarity. I'd brought along my yin-yang ring�the one that Brien gave me after certifying my full Yang-style curriculum. It is the same ring as the one Brien had gotten after Master Chung certified him. 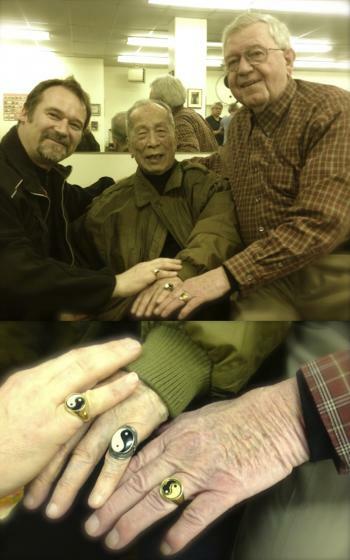 Master Chung, aged 100, acknowledges Sam as taijiquan 'master'. What a weekend of honors. To this embarrassment of riches I say 'thank you, xie xie, danke sch�n and gracias'. Often, when working with my groups, I teach material 'out of sequence'. By that I mean, not in the well designed order in which material appears in the traditional curriculum. For example, in the fine 'crawl-before-standing, stand-before-walking' logic of the past masters, we would first learn solo then partner bare-hand practices before studying weapons. But why? While it might be clear why sword precedes spear (shorter leading to longer, two main sticking surfaces versus a cylindrical surface, etc.) it may not be so clear as to why sabre precedes sword. 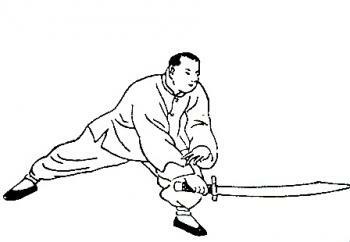 The answer cannot be found simply by studying solo sword and sabre forms. The secret lays in understanding the thirteen powers theory that underlays each aspect of the curriculum. Without mastering the eight cutting energies and five blade tendencies that define the dynamics of the single edged dao, much of the study of the double bladed jian or the long, smooth qiang will be ill-founded and even fanciful. The varying circumstances of different teaching situations often complicate the order of teaching. Sometimes groups learn sword before sabre simply because the elegance of sword movement draws more students. I'm always looking for ways to bring things on-track in a way that enhances students' understanding of traditional work. Many of this year's saminars are intended to give students an opportunity to deepen their understanding of the full curriculum by making clear the critical place of sabre study in the larger picture. In the end, we students of the art of taijiquan must, ourselves, take the initiative to try and practice with a full curriculum view. After 30 years, this is the last A Taste of China summer gathering. The amazing Pat Rice has been hosting taijiquan players from around the world for three decades and is now ready to retire the event. Through ATOC, North America was introduced to such luminaries as Chen Xiaowang, Yang Zhenduo and Wang Peisheng. The event pulled together many well known masters from the previously disparate taiji community: Abraham Liu, Benjamin Lo, Jou Tsung Hwa, Daniel Lee, William C.C. Chen, Liang Shouyu, Yang Jwing Ming, Yang Yang, Helen Wu, Wei Lun Huang and more. 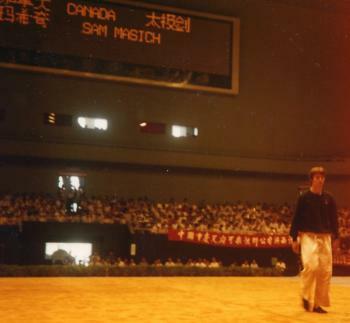 The event was part of the launch-pad for many 'home grown' masters such as myself and others like Nick Gracenin, John Painter, Mario Napoli, Jose Johnson, Chung Jen Chang, Jay Dunbar and many other mid-generation instructors. Thirty years of ATOC. Wow! The theme for this year's final event is 'transformation'�something I've seen a lot of in these past few years. The taiji players I know through this event have all transformed. And the art continues on, generation after generation. The art transforms us and we transform the art in the process. What a privilege to be a part of something like that! Martial arts takes time and effort. In fact this is the literal definition of the words 'kung fu'. Any thing or skill worth the having requires sustained input. I consider it a privilege to be able to work in arenas which demand attention to archs of development lasting years and even decades. The electronically delivered message of today's world seems to be the opposite however. Get-as-much-as-possible-as-quickly-as-possible has had catastrophic global consequences. As a result I think that many people feel time is running out and react by holding on as hard as possible to as much as possible. But holding on to what? Possibly to something not really worthwhile. Our modern 'way of life' is highly manipulated, manufactured and has been around only for a short time. It has led to strange ideas about freedom that seem to entail a lot of subservience. And life is short. Special thanks in 2011 to: R�al Lalande, Diane Vermette, le Centre de Tai Chi Gilles-Vaillant, Mary Hansell, Jill Heath, Adriaan Blaauw, Michael Blackburn, Jim Cryderman, Steve Higgins, Cold Mountain Internal Arts, Karin Collins, Hansoo Kim, Tom Cannon, City of Lakes Tai Chi, Dorian Gregory, Javier Arnanz, Paloma Botejara, AprendeTaiChi.com, Juan Carlos Serrato, Escuela Superior, Simon & Cher Robins, Tai Chi Wisdom, Oliver Rust, Franco Mescola, Centro Ricerche Tai Chi Italia, Ronnie Robinson, Brandon Shaw & Antje Lange and my buddy Karl. 2011: There is a lot going on this year. Classes in Canada, Germany, Spain, Italy and England are going strong with some very interesting topics on offer. 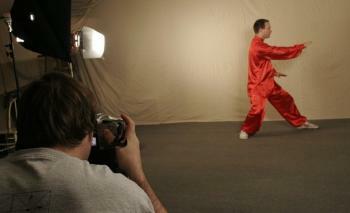 In April in Madrid I will teach the rarely seen Chen Yanlin variation of the Yang-style Taijidao. In the same month in Brighton I will begin teaching the full traditional 108 movement Yang Taijiquan long form over three sessions. I look forward to a return to Vancouver in May as part of a Canadian Tour. In July I will be at Tai Chi Caledonia as a guest instructor and then once more in Canada for an intensive in Gatineau, Quebec with Jill Heath and Adriaan Blaauw. There we will focus on the partner-work from the 5 Section Taijiquan curriculum. Looking forward to AquaVenice again as well! I was very pleased with the level of work we did in last summer's Berlin Push Hands Camp and we continue this event again following the 5th Annual Madrid Push Hands Camp. Another interesting teaching project this year will be a two 'twin' workshops with Italian taiji master Franco Mescola. We will do one in Venice and one in Berlin. The biggest and shiniest event this year however, is the 10 day 13 Power Taiji Sword Intensive in Madrid in Nov/Dec. This will be a high level international class in one of the most fascinating capitals in Europe. Should be a wonderful year filled with great events! Special thanks to: Oliver Rust, Javier Arnanz, Simon & Cher Robins, Mary & Roger Hansell, Steve Higgins, Alpha Montemayor, R�al & Diane, Jill & Adriaan, Antje and my buddy Karl. Inspiration. My father, Tom Masich and my first martial arts teacher, Brien Gallagher, both competed in my home province's 23rd BC Annual Senior Games. Dad received a silver and three bronze medals for his performances in shot-put, discus, javelin and hammer-throw, while Brien medaled gold in Archery. While 'retired', they both continue to improve their skills. 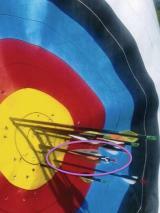 Last year Brien - in a real life Robin Hood moment - won gold by penetrating the arrow of his rival! Lately I've been getting my new practice space together. I still have work to do. I still have time to do it. I am still inspired! Special thanks to: Oliver Rust, Javier Arnanz, Simon & Cher Robins, Mary & Roger Hansell, Steve Higgins, Alpha Montemayor, R�al & Diane, Tom Cannon & Cecily Brown, Trude Smoor, Dorian Gregory, Jill & Adriaan, Jean Kirk and my buddy Karl. It takes years. There is no way around this, and anyways, how could it be better if it didn't ripen with time? Time and practice provide the meaning for the word kung-fu. I feel rewarded and honored each time I teach, by the dedication and effort of my students and by having the opportunity to share in this work these last 30 years. In the month of July, ten courageous students will tackle the entire 5 Section Taijiquan curriculum in Gatineau, Quebec. In August we'll have two four-day push-hands intensives in Europe, one in Madrid, Spain and the other in Berlin, Germany. Looking forward to our next meetings. Special thanks to: Mary Hansell, Oliver Rust, Javier Arnanz, Simon & Cher Robins, Michael Blackburn, Josie Loehrich, Jim Cryderman, Christian & Jerri, Jill & Adriaan; Anne, Tom & Laura Masich and my buddy Karl. Sometimes it looks like - in spite of all effort - no progress is being made. There is activity but the meaning and value is unclear. There are plateaus on the path to mastery and these can even feel like regression. In these times it is difficult to let go of fear and to trust. The way IS the way. It is not other. Keep playing! Special thanks to: Mary Hansell, Jean Kirk, Steve Higgins, R�al Lalande, Oliver Rust, Javier Arnanz, Simon & Cher Robins, Caroline, Christian & Jerri, �ngel & Paci, Matthias & Huberta, Paloma, Laura Masich and Karl. It's been the better part of twenty years since the first developments of the 5 Section Taijiquan program. The 'Wuduan' curriculum has expanded to its present form with the help and assistance of many people along the way. It is very gratifying to see interactions with people from opposite ends of the world who have never practiced together, as they launch smoothly into the 5 Section two person bare-hand form or play push-hands informed by the practice of jue-shou. And the fun continues. This winter will see the first four-week 5 Section Taiji Full Curriculum Intensive in Madrid, Spain (Nov. 20-Dec. 14). The event is hosted by Javier Arnanz who is a graduate of the 2007 teacher's training and certification program held in Vancouver, Canada. In July 2010 the course will be re-offered in Gatineau, Quebec in Canada with the assistance of Jill Heath and Adriaan Blaauw, also graduates of the 2007 training. And discussions are underway for a similar Brighton U.K. event in early 2011. It's not only graduates of the intensives; there have been several thousand students from various workshops, programs and who've studied the 5 Section DVDs. I look forward to a 2012 International 5 Section Taijiquan gathering! Wouldn't it be great? By this time we could see the publications of the reference texts. Look for 'LUCKY TIME' in the the spring of 2010. Special thanks to! Mary Hansell, Jean Kirk, Steve Higgins, R�al Lalande, Michael Blackburn, Oliver Rust, Simon and Cher, Caroline Ross, Christian and Jerri Auger, Ronnie Robinson, Paul Pitzel, Matthias and Britta, Matthias & Huberta, Andrew Feldm�r, Paul Pitzel, Laura Masich and Karl. 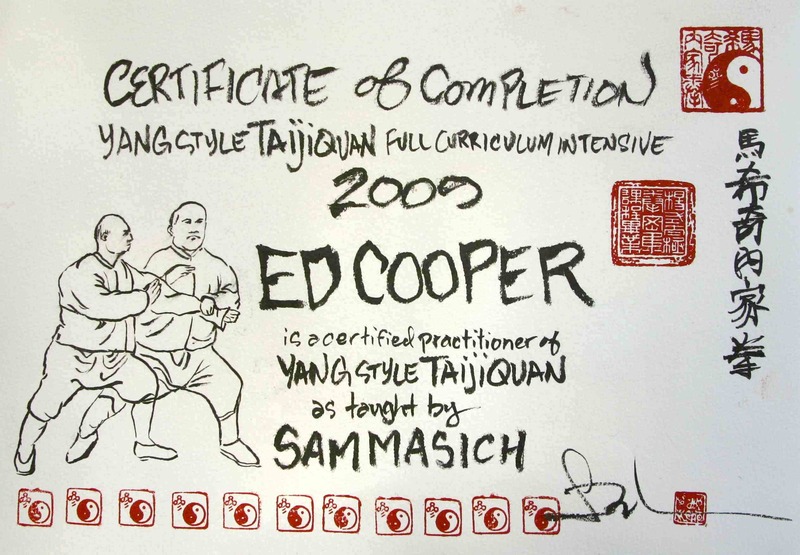 The 2009 Yang-style Taijiquan Full Curriculum Intensive was an amazing experience and a journey of transformation for all involved! Warm and fuzzy congratulations to: Javier Arnanz, Erik B�ez, Karin Collins, Ed Cooper, Trude De Jong, Declan King, Tony Galis, Dorian Gregory, Mary Hansell, Bobby Kaplan and Simon Robins. These brave and dedicated taiji players came from Canada, USA, M�xico, Spain and England in order to study the entire curriculum of Yang-style Taijiquan for three months. Please welcome these burgeoning masters as they charge back into their communities with a whole new level of skill and commitment! Read my week-by-week account here. This was the second time I taught an intensive of this scope and I learned a lot in the process: about managing the huge body of material and about the curriculum itself. At the end, students received individualized hand-drawn certificates. Those of you interested in doing something like this (in about 2 years) should begin your curriculum building now to qualify for the training. 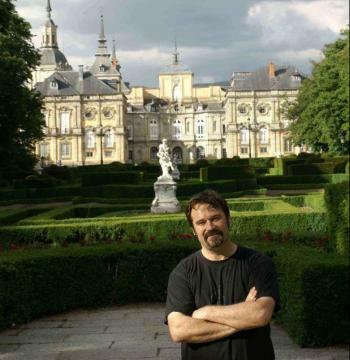 In the meantime, I'm preparing for the 5 Section Full Curriculum Intensive in Madrid Spain (Nov. 20-Dec. 14). The class is filling up but there may be a couple spots if you get your registration in before the end of April. 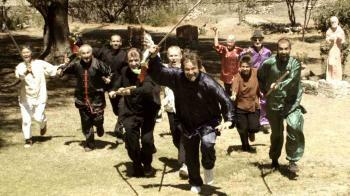 Also: keep checking back for a three week San Miguel Taijiquan Intensive next year in 2010. In music news: While I was in San Miguel I recorded ten songs with a phenomenal band; Bobby Kapp (drums), Gabriel Hernandez (piano), Tyler Mitchel (bass), Ken Basman (�Bobby and Ken trained in the Yang Intensive as well!) The album�'LUCKY TIME'�features new treatments of several favorite SamSongs previously recorded by other artists. Songs include: 'Roses on a River', 'Diamond Space' and 'June', as well as unrecorded songs such as: 'Berlin Boy' and 'Blues & You & Me'. Look for 'LUCKY TIME' in the summer of 2009. Special thanks to! The Yang Intensivers, Bobby & Cilla, Ken & Alina, Matthias & Huberta, Caroline Ross, Christian and Jerri Auger, Paul Pitzel, Anne Masich and Karl. The fate of the Dow Jones industrial average seems to have come to define how many people feel about the fate of mankind's destiny and their own. "The Dow is down�oh no, is it a recession or a full-blown depression?!" "The Dow is up�can we breath again? Is the economy on an upswing?" In accordance with the Dao, things recede and they swell; they fall and they rise. It is not possible for something to constantly expand or grow. When 'tai yang'�the great outer extreme�is reached, inevitably thing must contract. Great anxiety can prevail if we follow the increments too closely. 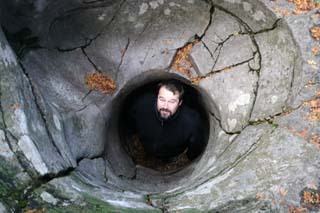 Larger and smaller cycles are always at interplay. Notice that autumn came and that winter is on its way. Notwithstanding humanity's effect on nature�a byproduct of the notion that constant economic expansion is the only way to sustain civilization�nature continues to take its course. Get your legs under you! Take a breath or five. Discover a place of inner calm. Feel your ever-present centre. Re-discover your rooted connection to the ground and draw energy from this process: 'breath�calm�centre�root�energy'. Less the Dow. More the Dao. To be hollow is to be filled. To be tattered is to be renewed. To be in want is to possess. To have plenty is to be confused. And becomes the model of the world. Special thanks to! Javier & Paloma, Stephan & Irena, Matthias & Huberta Bettex, Professor Vogel, R�al Lalande, Kevin Heckindorn, Gloria Jenner, Roger & Mary Hansell, Simon & Cher, Oliver Rust, Helmut Oberlack, Caroline Ross, Christian and Jerri Auger, Paul Pitzel, Barry Luger, Julia and Karl. Hello to you as the Vancouver Summer Push Hands Camp begins. How fortunate to be able to work together on this kind of material, with these kind of people in the places in the world where we meet. Recently, in Brighton on the southern England coast, a great group of taiji folk, including three from Finland and two all the way from Texas (many of you know Christian and Jerri Auger from past Vancouver Push Hands Camps), studied on the 5 Section Taiji Sanshou form. We had a nice, open, breezy space arranged by our lovely hosts Simon and Cher Robinson. Christian and Jerri and I enjoyed London for a couple days and the generous hospitality of taiji friend Caroline Ross. We then travelled up to Stirling, Scotland for Tai Chi Caledonia. 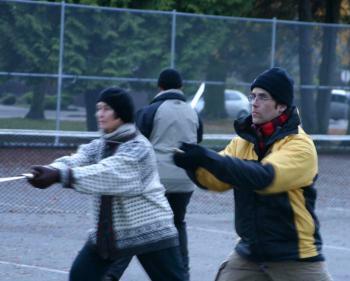 Tai Chi Caledonia was a fantastic experience organized by the inimitable Ronnie Robinson. Haggis, the Wallace Monument, Leonard Cohen at Edinburgh Castle and taiji everywhere! 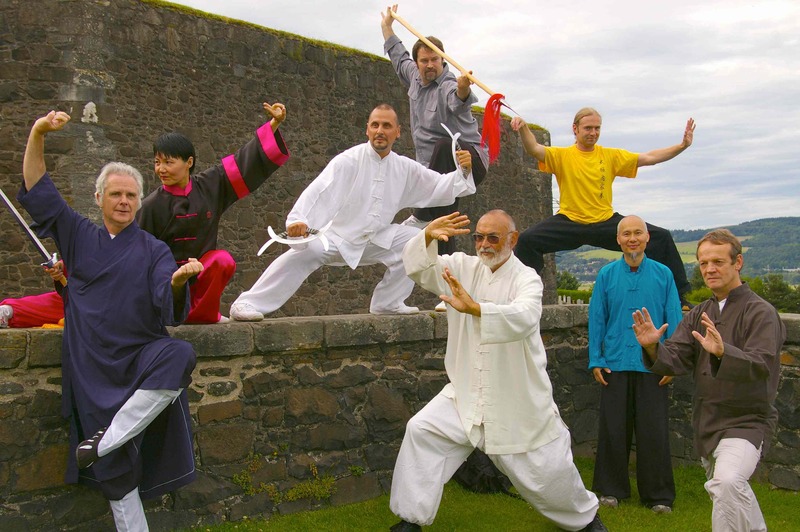 There was an instructor's demo at Stirling Castle, I did an impromptu concert with taiji/music man Bob Lowey I enjoyed a reunion with Italian baguazhang instructor Luigi Zanini who I'd last seen at A Taste of China in Virginia ten years ago. I recommend the Caledonia experience to all! Madrid for a 4 day Push Hands Camp and Lalita for the Internacional Taichichuan Festival in Spain. I will take a much needed September break in Berlin. (Keep an eye open for interesting taiji developments there as well!) Then October will see a tour in Ontario and Quebec. Special thanks to: Nils Klug, Daniel Mroz, R�al Lalande, Jean Kirk, Mary Hansell, Jill Heath, Simon & Cher Robinson, Ronnie Robinson, Caroline Ross, Javier Arnanz, Christian and Jerri Auger, Paul Pitzel, Julia and Karl. For some reason Spring always makes me feel nostalgic. Something about the scent of the awakening season triggers experiences from my yesteryears. While I was in England teaching recently, I managed a trip up to London to see the 'First Emperor' exhibit at the British Museum. It was exactly half my lifetime ago that I first saw the Terracotta Warriors of Emperor Qin Shihuang in Xi'an China, where I was visiting as a member of Canada's first national Chinese martial arts team. Xi'an was my first big international cultural experience, my first big exposure to modern and traditional Chinese martial arts as practiced on 'the mainland', and my first real personal connection with Master Shouyu Liang who was to become one of my most important mentors. It is here I received the name 'Maxiqi', a transforming experience! Now I am poised for another big life change. It seems that I, my partner Julia and our 18 month old son Karl, will settle this year in Berlin, Germany. I have been spending close to half my time in Europe these last few years so for many of you this will come as no surprise. I will continue to work with my many fine North American students from various locations in Canada, and also continue to develop the work which has begun with many earnest and talented European practitioners. Content on SamMasich.com will develop accordingly. Expect to see more multilingual material, notices for seminars in interesting locations (eg. 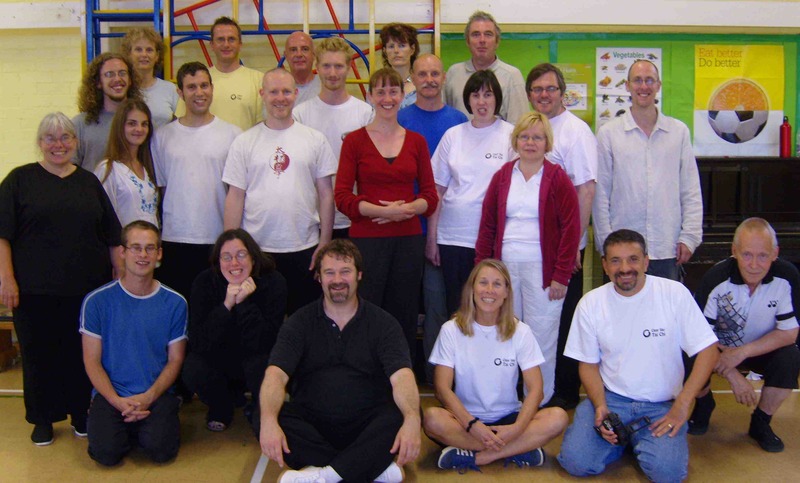 a European '5 Section Taijiquan full curriculum intensive' around the end of 2009) and, at some point, a Euro�Taiji event which combines training and touring! Its nice to have a break and start thinking about next year's activities. Lots of taiji, some music and hopefully a lot of writing. I'll be based in Canada the first half of the year and Germany the second half. I'm very excited to announce the Yang-style Taijiquan Full Curriculum Intensive. The dates and location are still subject to change so stay tuned. Details should be finalized by mid-Jan '08. Have I said this before? I feel fortunate to have such incredible students and be able to work in such great circumstances with them. Case in point: The Full Circle.For the last four years I've been invited to mentor a group of incredibly dedicated advanced students who have taken the initiative for advancing their training as a 'practice collective'. The group has been inspiringly democratic and open to one another's suggestions, points of view and needs for support. May I suggest you find a way to do such a thing in your own part of the world? And now another group of keeners dives into the 5 Section Taijiquan Program Teachers Training and Certification. Six weeks, four days a week�Tai Chi heaven if you ask me. � Friends & Associates' page. � 'Special Intensives' page which will cover current and archived events. 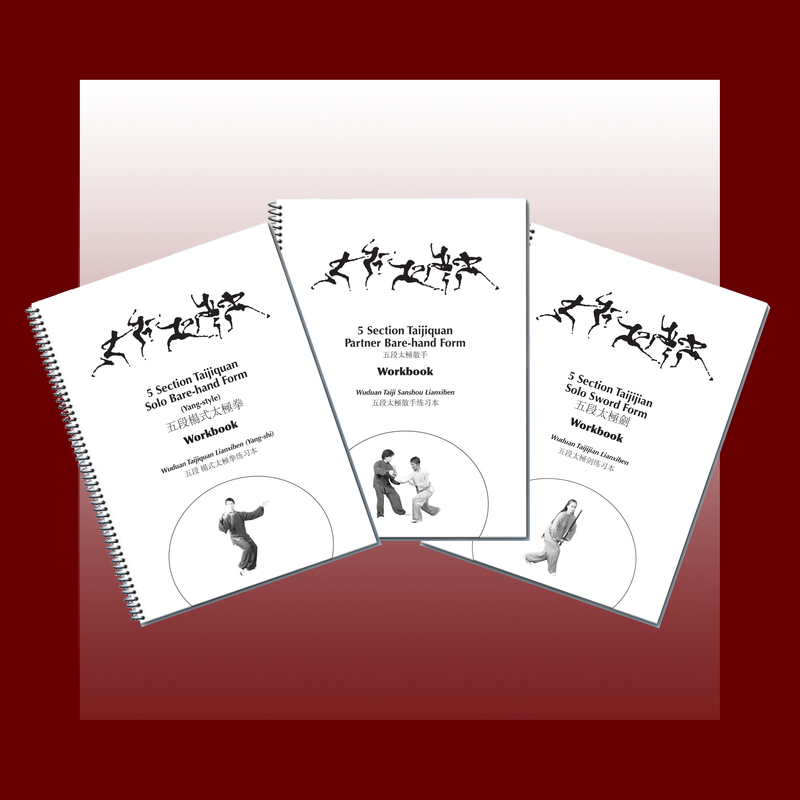 � '5 Section Taijiquan Program' page with downloadable handouts for all the forms. � 'Yang-style Taijiquan' page, which will delve into the Yang curriculum as taught by yours truly. � 'Yang-style Taijiquan Full Curriculum Intensive' page, devoted to�are you excited?�next years Yang Intensive! � 'Studying With Sam'. An overview of my work with links to special intensives. A few other things are in the works as well, so stay tuned. We are constantly expanding the site to provide you with more info and inspiration. This has been the first summer in seventeen years that I have not taught my summer Push Hands Campin Vancouver � and boy do I feel it! Some of you have become truly excellent practitioners and it is a joy to touch in to such well cultivated energy. I am used to getting a big 'qi-hit' every July/August. I have been to a couple European events; Tai Chi Caledonia in Scotland, Rencontre Jasni�res in France and Festival Internacional de Taichichuan en Espa�a in Spain. These were well organized, well attended, good spirited gatherings and I met a lot of excellent people. As in North America there is a strong tendency in Europe towards what might be called 'double-grabbing' push hands. This problem seems to plague taijiquan practitioners everywhere. 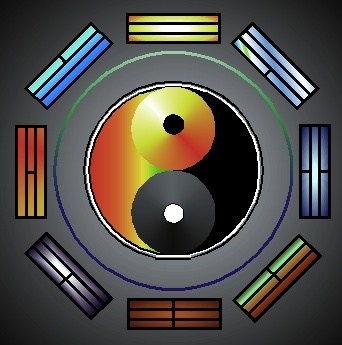 Double grabbing, an activity characterized by the closure of both hands on another person�s body while engaged in tui shou could fall into the category of si yu energies as a form of �double cai�. However, this is a generous categorization as no classical writing appears to support this �technique� and, in the few places where something like double-grabbing exists in what might be deemed traditional forms and drills, it comes in the form of defensive neutralization. If a player simply grabs symmetrically with both hands he or she is not �sticking-adhering� and therefore can not employ the further progressing energies such as listening, receiving, neutralizing, etc. Double grabbing of one or both of the opponent�s arms is characterized by jerky, yanking movements intended to �out-speed� the opponent in his or her response. Double-grabbers generally lurch forward, keeping their hips back. Their feet tend to �skitter� about nervously, either looking for an opportunity to lunge in or in expectation of having to jump back suddenly. In the worst cases the double grabber�s footwork resembles that of a person at the edge of a cliff anxiously preparing to jump to the other side. I have met a lot of practitioners here who, while seeming to be otherwise quite discerning regarding taijiquan forms, history etc., seem to lack the basics of 'sticking' due to the above mentioned tendency. I'm sure there are many excellent players I've yet to meet and I look forward to future sharing. It seems that many practitioners around the world are hungry for a different experience of push hands. In the recent four day push hands 'sticking' intensive in Madrid, participants came from all over Spain, from Norway, England and Canada. It was an excellent class with about 30 participants, over half of whom were instructors. 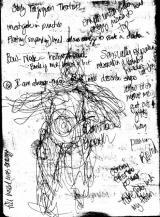 So, ultimately I feel encouraged, about the work, about the people I'm meeting in Europe and about the future of our art! By the way, plans for a 2008 Vancouver Summer Push Hands Camp are still on although the dates may differ from previous years. It was exactly 2 years ago that we launched the first phase of this website and, aside from a little tweaking, Phase II is now complete! Huge thanks to Hansoo Kim and John Zietlow of ARKIOM for their work on getting the e-commerce part of the site up and running. Now you can purchase DVDs, CDs and more online. And it will all get better with Phase III. We plan to have online discussion boards, links to other teachers and musicians, a dedicated FFMmusic.com website, new internal arts products and more. One of the big hurdles for me in the past few years has been the completion of 3 of the 'old' videos shot in the early �90s. I am happy (and relieved) to announce the DVD release of: the Push Hands Video Manual vol. 2 (Da Lu); the 5 Section Chen Taijiquan solo form; and the Zheng Manqing Taijiquan (Ch'eng Man Ching T�ai Chi Ch'uan) 37 form with Marek Ostapkowicz. Completion of these titles allows the Sam Masich Video Classics Collection to ship in its entirety. Another new Little Productions DVD is the: Yang Style Traditional 54 Tai Chi Sword, the second in the Little Productions Official Bootleg Series. Other developments in these past two years have been the re-introduction of the Strange Horse News, preparation for the first ever 5 Section Taijiquan Teacher�s Certification (which will take place in Vancouver through November/December); and a first 4 day Push Hands intensive in Spain. Thanks for your support of the website and of my work these last two years and stay in touch with me through SamMasich.com! PS: Those of you who have been waiting for the 3 �coming soon� titles can expect to see them in your mailbox soon! What an amazingly fragile thing it is to be here and alive on planet Earth, hurling through space, clamouring about on the 4% of this globe's livable space as if it will all go on the same way forever. Its easy to overlook the incredible priviledge of being alive. On October 5 this year, my partner Julia and I had a son. Karl reminds me everyday how delicate it all is. As this year draws to a close, I look forward to an interesting 2007, full of discovery and re-affirmation in my life of the 'rightness' of Taijiquan. I will be home more during the early part of the year so look for more workshops and music events here in British Columbia, especially at the studio in Vancouver. We will be in Europe all summer (mostly in Berlin), so there will be no Push Hands Camps in Vancouver this year but we'll pick up again in 2008!. For the first time, Aug. 11-14, there will be a four day Push Hands event in Madrid. Stay tuned for details. Come one come all! I'm very happy to announce the return of the Strange Horse News. For many years this was the main way students and fans could stay in touch with what was happening in Sam-land. The only problem was the huge paper load I'd send out for each edition. Now you can download the most recent edition and archives on a dedicated page here on the website. In future editions I'll offer more in the way of articles, book reviews and special offers of both video and music. The Ontario/Quebec tour is imminent and I look forward to seeing old friends and new faces as we share in this fascinating, ongoing Tai Chi journey! There is a park, a big one, next to what used to be an abattoir the scale of those formerly found in East Philadelphia. 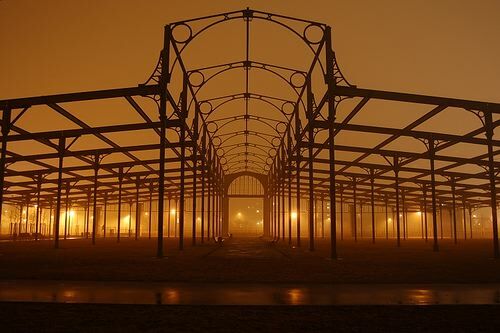 The ancient German brick buildings sit empty awaiting new industry, but the park itself is lively, filled with skaters, mothers with prams, a children�s park and, on the far end toward the Storkower Stra�e S-Bahn station, what seems to be a memorial devoted to the abattoir's history. The 15 metre high �Denkmal� consists of 100 green concrete posts which support a roof like structure formed of green I-beam steel spans. But there is no cover to create an actual shelter, only the frame. 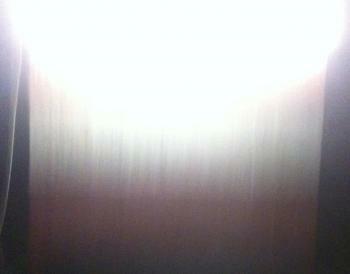 One post, three rows over and one row down from the southwest corner, is different. It is sheared cleanly at the exact height of my navel and on the flat top, the word �THINK� is written in thick black strokes, in English. It is here that I practice my Tai Chi. The �little post� has become a leg stretch support, a rucksack hanger and a vaulting device. While all the other posts sit on clean, square brick pads as they fulfill their proud duty of holding up the useless roof, the little post sits within a cluster of shaggy grass which grows up its base, tickling it. I wonder what my son will be like. Will he take his place in society in a well appointed manner, perhaps in one of the more important posts? Or might he, like his father, take his joy in some one-in-a-hundred oddity; a post which is not a post, somehow cut off from the rest of the structure, its only real purpose being the possibility of play and the admonishment THINK. I�m back in Vancouver for the summer after a long stay in Berlin. I am truly looking forward to some serious Tai Chi immersion in July and August. The 16th Annual Push Hands Camp... the 12th Annual Prince George Tai Chi Camp... How many times have we turned that circle? My focus has been on writing lately and, although it�s slow going, something is starting to take shape. The Sam Masich Video Classics Collection is getting great response and plans for some updates to the look and functionality of the SamStore are in the works. Stay tuned for info on this Autumn's workshops, events and releases! Tai Chi focuses greatly on efficient use of energy in the accomplishment of appropriate results. Many useless and ineffective expenditures of potential can be avoided by grasping the context in which events take place. By adopting certain qualities of character it is more likely that one will perceive and comprehend these factors. Know the spirit of the time and the history beneath it. Predicaments are usually forseeable. Recognize what is missing. Revise opinions in light of better information. Suspect all belief. Give prefence to those endeavours which humans can uniquely undertake. Have noble aspirations and priorities. Let knowledge serve purpose. Avoid being trite but not by pretentiousness or affectation. Listen first. Remember sources of knowledge. To surpass teachers it is not neccesary to outshine them. Maintain relationships with knowledgeable people. Receive council graciously. Be gracious more than clever, graceful more than dexterous. Rude and bold are not the same. Actions have more effect than sentiments. Begin and complete undertakings. Think, and think ahead. Do not over-reach, rather, let others approach. Keep one foot back. Avoid all forms of dependency. Distinguish between qualities of character and personality. Act decisively with enemies and flexibly with friends. Be cautious with unhappy and unlucky persons. To abide the envy of others is to let oneself be harmed. Extend mercy but do not expect it. Be grateful but do not expect gratitude. Cultivate tolerance for the flaws of others. In acts of self interest find ways of benefiting others. In attemping to accomplish self-sufficiency, maintain personal privacy but do not self-isolate. Learn to both respect and challenge personal habits, rhythms and preferences. Practice relaxing in uncomfortable situations. Relax but do not collapse. Embrace adversity. Strive, but without strain. Avoid expending to the point of insufficiency. Store reserves for times of decline. Go slowly if it is not neccesary to go quickly. Be able to keep secrets. Reputation can eclipse any particular victory or defeat. Consider outcomes but retain spontaneity. Act appropriately for time and place but be not defined by either. It is easier to add a word later than to withdraw one. It is easier to obtain forgiveness than permission. Suppleness endures what strength cannot. Cultivate self tolerance. Know your value. If possible, be likable. Enjoy beautiful appearance but let delight lead to deep levels of appreciation. Master passions. Cultivate empathy and goodwill. Practice receiving in all things. Choose information over opinion, knowledge over information, wisdom over knowledge, love over wisdom. Find the inherent humour and gravity in all situations. Timing is the final secret in any art. What does napalm have to do with children anyhow? Hard-power is easy to identify, soft-powerseems amorphous. Hard-power functions through opposition, soft-power functions via inclusion. Hard-power is reflexive and instinctive, soft-power is cultivated and often counterintuitive. Hard-power necessitates speed in its expression, soft-power possesses options around the use of speed. Hard-power is domineering and threatens, soft-power engages and allows. Hard-power is short lived, soft-power endures. Hard-power breeds corruption, soft-power requires integrity. Hard-power is egotistical and self interested, soft-power is modest and generous. Hard-power is humourless, soft-power is playful. Hard-power is arrogant, soft-power is humble. Hard-power constructs hierarchical paradigms, soft-power allows structure to form around realities. Our friends in Peterborough Ont. recently lost a wonderful Tai Chi friend to cancer. 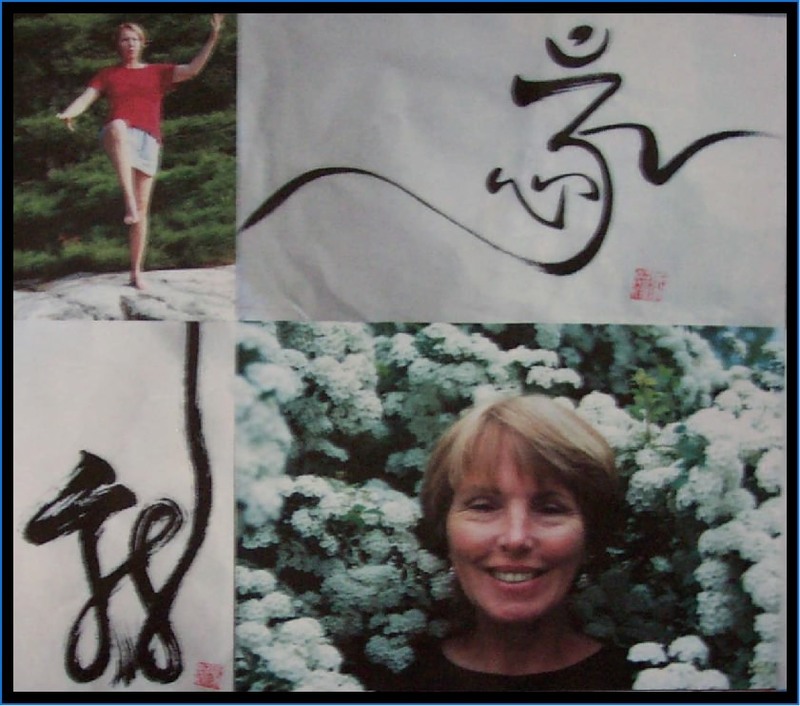 Marnie MacQuarrie was as graceful in her Taijiquan as she was gracious in her life, and as thoughtful in her calligraphy as she was considerate with her friends. Here is a short message I was able to send to her in her last days. Much love and thanks for our connection in this world. I love being in this part of Canada this time of year. Blazing red, yellow and orange roadsides and Canada geese soaring through clean, soft air. Having just finished my Autumn tour of Quebec and Ontario I'm feeling great about Tai Chi and my students. It never ceases to amaze, impress and inspire me, the work you all put into studying this art. We've worked hard yet playfully on barehand and sword, solo and sparring forms, and as I watch the skill level grow season after season I think to myself, "I have the best students." I'm off to Germany and Spain for a month of Tai Chi, music and adventure. Hasta luego, tsch�ss! It's been a fine summer in Vancouver and I'm getting ready to get back on the road. In mid-October I head to Quebec and Ontario, and from there sojourn to Germany and Spain where I have some workshops and a few music events waiting. You may notice that I don't have any U.S. dates scheduled. There is some buzz around the fact that I have decided not to teach in America so I have decided to post a letter explaining my some of my reasons. We've just finished the summer Push Hands camps here in Vancouver and they were great! 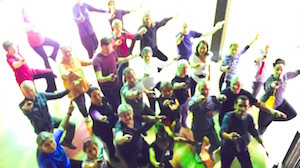 Imagine 24 dedicated Taijiquan practitioners from Canada, USA, Mexico and Puerto Rico working for 4 days on subtle, advanced energies of Push Hands. As a special treat were joined by Masters Shouyu Liang and Andrea Falk. This is my first on-the-road update. I'm currently in Germany with FFM and the tour is going great. 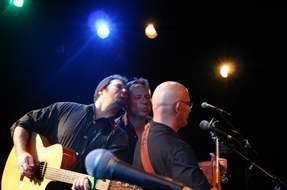 We've played in castles, concert halls and in an ancient club under the S-Bahn in Berlin. We've done some cool radio interviews, a TV spot and are looking at an import and publishing deal for Germany, Switzerland and Austria. Next stop Winchester VA for A Taste of China and the USA All Taijiquan Championships! Hi, and welcome to SamMasich.com! It's been a big project getting this site up and running and it wouldn't have been possible without the expertise of Hansoo Kim, John Zietlow and Heather Gardener-Madras. So first off, THANKS Han, John and Heather! This has been a real transition time for me and launching this website feels like part of a new chapter being written in my life and in my work. I am on tour teaching and giving concerts as Phase I of this website launches and will give updates as the tour evolves. I look forward to seeing some of you in 3D over the next few months but if not, now we can keep in touch through the site.